(OT) STAP Cell Researcher Says, "I Want to Be Reunited with My Sons from Whom I've Been Separated"
So, the so-called "STAP cells" have undergone gender reassignment - from "princess" cells as Ms. Obokata (lead author of the two Nature papers) once wanted to name them, to "my sons". There's got to be a better profession for this so-called researcher than being a researcher. A comedienne or a politician comes to mind. According to Mainichi Shinbun (6/11/2014), Ms. Obokata, who has been staying at a hospital, has been in fact "advising" Riken researchers how to create the so-called STAP cells since last month. Mainichi also quotes the lead attorney employed by Ms. Obokata (she has four attorneys), who told the press that his client says she wants to look for her sons (STAP cells) whom she has been separated from. One prominent Japanese scientist (and a mother) who heads a laboratory in a US research institution is furious, and she tweeted, "You have already made a mockery of biology. Stop insulting women and female researchers further. I'm ashamed." Other net citizens wonder aloud how Ms. Obokata could look for her "sons" when the "sons" may not have been born to begin with. Nikkei Science and NHK reported today (6/11/2014) that her "sons" may not be STAP cells but ES cells (embryonic stem cells) with a particular genetic defect. That particular defect, "trisomy" (having three copies) of chromosome 8, has been found in almost all cells that were presented as STAP cells which was supposedly made from one-week-old mice. Trisomy of chromosome 8 results in death of an embryo. In other words, there cannot be any mouse born with trisomy of chromosome 8, and STAP cells cannot be made from cells taken from a mouse with trisomy of chromosome 8. On the other hand, 20 to 30 percent of cultured ES cells are known to have trisomy of chromosome 8, according to Nikkei Science and NHK who quote both Riken researchers and Tokyo University researchers who analyzed DNA of the STAP cells. Oh well, minor details for non-scientists or people with little to no interest in science who are the majority of people in Japan and probably elsewhere. Post-Fukushima Japan (and perhaps elsewhere) seems to think that if you cannot 100% prove certain things do not exist - be they STAP cells or acute effect of long-term low-dose radiation exposure - then it is possible, or even highly probable that these things do exist. While I do not think much at all of the initial editorialization of the confidential testimony given by Plant Manager Masao Yoshida to the government investigation of the accident and which Asahi somehow obtained, the special webpage dedicated to reporting on the testimony has some good photographs. Here's one for the "epilogue" (so their reporting is ending already) about the Reactor 4 Spent Fuel Pool. According to the credit of the photo, it was taken from Asahi's helicopter on December 15, 2013. Unlike photographs of Fukushima I Nuclear Power Plant which mostly show the plant only, this one shows Okuma-machi (south of the plant) and Futaba-machi and toward Namie-machi (north of the plant). No one (officially) lives in Okuma or Futaba. 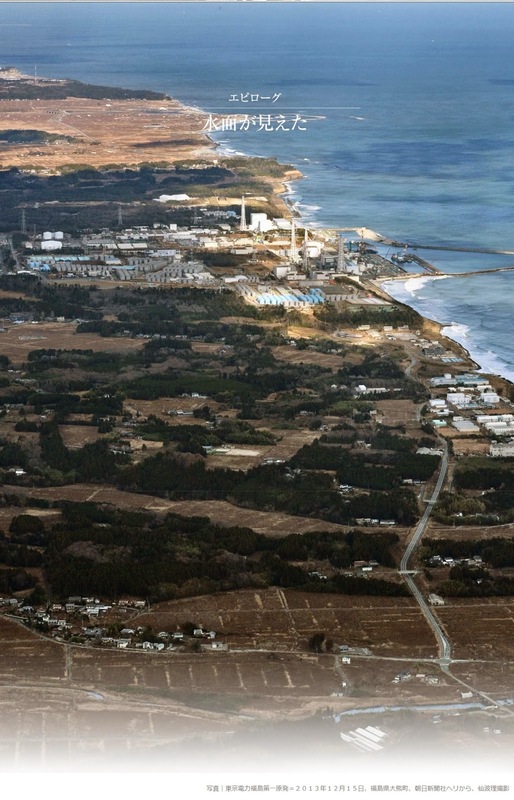 The coastal area of Futaba and Namie (above Fukushima I NPP in the photo) looks to have been wiped out by the March 11, 2011 tsunami. There are houses hugging the hills in Okuma, but the abandoned fields look overgrown. No one there to till the land. No one is returning anytime soon to the area right below (south) of the plant. The area is called Ottozawa. The highest ambient air dose level in Ottozawa at present is 28 microsieverts/hour as measured on June 5, 2014. Ottozawa has had one of the highest ambient air dose levels inside the former evacuation zone, located right up against Fukushima I NPP. In February 2012, contract workers "decontaminated" the area in 70 to 130 microsieverts/hour radiation (see my post on 2/9/2012). Using the formula to calculate additional annual radiation exposure even with using the coefficient of 0.2 (instead of 0.4 for wooden structure; see my 6/8/2014 post), it would be additional 114 millisieverts in one year at the current ambient radiation level. Confusion and misunderstanding ensue, following the reporting on the Ministry of the Environment's plan (yet to be officially announced) to raise the radiation target level after decontamination in Fukushima from the current 0.23 microsievert/hour to 0.4-0.6 microsievert/hour. The Ministry of the Environment (supposedly) says the additional exposure from the radiation under the new target level will be still under 1 millisievert per year. The empirical data so far collected in Fukushima Prefecture (glass badges worn by residents, monitoring posts, actual measurements before and after decontamination, for example) seem to endorse the position by the Ministry, but this particular ministry unfortunately lacks credibility after having been headed by Goshi Hosono (DPJ) and now by Shintaro Ishihara's son who once wanted to ban the use of personal survey meters by citizens. The Ministry and the municipal governments involved seem to be doing this for very wrong reason, if what Fukushima Central TV (FCT)'s reporting is correct. To them, it is about cost-performance - too costly and time-consuming to decontaminate to the 0.23 microsievert/hr level. But again, this is according to the TV station reporting, and the official word from the Ministry is not expected for two to three months, according to Asahi Shinbun. FCT has found that the Ministry of the Environment has been discussing with the municipal governments [in Fukushima] on the new policy on decontamination which is considered to be prerequisite for recovery from the nuclear accident. The new policy would raise the target ambient radiation level that decontamination should achieve from the current 0.23 microsievert/hour to about twice as high as the current level. In the decontamination guideline by the Ministry of the Environment, the target ambient radiation level after decontamination is set at 0.23 microsievert/hour. This number is calculated from the additional annual radiation exposure [target] of 1 millisievert. The Ministry of the Environment has been discussing with the municipal government involved to raise the target level to 0.4 to 0.6 microsievert/hour, which is about twice as high as the current level. Some municipal governments in Fukushima Prefecture have requested the Ministry of the Environment to revise the target radiation level to something more realistic. The current target of 0.23 microsievert/hour is too difficult to achieve, according to these municipal governments. Officials at the Ministry of the Environment say the actual additional radiation exposure per year will still be under 1 millisievert even if the ambient radiation level after decontamination exceeds the current target level of 0.23 microsievert/hour. They will have a meeting on June 15 with the municipal governments involved to discuss raising the target level for decontamination. The effective dose measured by glass badges is shown to be about half to one-third of the dose calculated by the Ministry of the Environment from the ambient radiation levels indicated by monitoring posts. (1) Subtract background radiation level of 0.04 μSv/h (pre-accident Fukushima average) from the current ambient radiation level. (2) Multiply (1) by 8 hours as number of hours one stays outdoors per day. (3) Multiply (1) by 16 hours as number of hours one stays indoors per day, then multiply by the coefficient 0.4 to account for shielding effect of the buildings (houses, offices, etc.). (4) Add (2) and (3), then multiply it by 365 to come up with the annual additional exposure dosage in microsievert. (5) Divide (4) by 1000 to come up with the number in millisievert. Instead of saying "Decontaminating until the ambient radiation level drops to 0.23 microsievert/hr is too costly and near-impossible to achieve," the Ministry of the Environment could admit its mistake in setting the coefficient at 0.4 (to account for one- or two-story buildings made of wood, according to National Institute for Radiological Science). Date City's result indicates that the coefficient of 0.2 (to account for one- or two-story concrete buildings) would be closer to the actual effective radiation dose. Children and adults in white-collar jobs may be spending the bulk of their time in buildings that are more than three-story high and made of concrete (schools, office buildings), and the coefficient for such buildings is 0.1. We will have to wait for two to three months until Shintaro Ishihara's son (Minister of the Environment) officially announces the change, but Japanese Twitter is already full of people thinking that the national government is raising the additional radiation exposure per year allowed for Fukushima to 2 millisieverts.